Formula 1 championship to begin in Australia on 25th March. Formula 1 is perhaps the most strategic sport in the world. The sport in which brains and brawns matter equally. Bound by strict rules and regulations, it is also one of the most complex structured sports events and is the most popular sporting event after Football World Cup and Olympics. The sport is no simple ball game; the team which has the best strategy and machinery wins. You are very likely to be disappointed if you think Davids stand some chance against the Goliaths. This sport represents the pinnacle of engineering; the slightest departure from the intended design can cause a disaster. It can make or break a championship. Various elite manufacturers use it as a platform to exhibit their technical prowess. The drivers become demigods. Adored by generations, they live in the fans' hearts. As the new season begins, the fans are exalted because of the reason that this one could be a lot different from the previous ones. The teams have already given a small glimpse of the changes made, during the winter testing in Catalunya, Spain. A brief video released on the YouTube channel of Mercedes showcases a study of 2017 and 2018 cars. The presenter shows us the new features as well as the ones which will not make a return this year.We may safely say that the presenter has not given away all the specifications and details, which are more closely guarded than most of the secrets. In this article, a synopsis of rules and regulations for 2018 are presented. After a host of significant amendments to regulations, F1 is all set to return on 25th March at Australian Grand Prix. During the last season, all the teams were eagle-eyed and interpreted the regulations to suit the design demands. The vaguer the stipulations become, the more grey areas the manufacturers exploit. One such loophole led to the creation of T wings and shark fin engine covers, which significantly changed the aero performance of the cars. This season, the F1 regulating body, FIA, has clamped down and made tighter regulations than that of the previous year. Some of the stipulations for the new season are ( courtesy F1 official site). During the dark ages of the sport, leading up to the 90s, the driver safety was not of paramount importance to the teams. The passing away of Ayrton Senna changed the way teams looked at driver safety. Despite being a dangerous sport, only one life was lost after Senna's. This year, F1 fraternity continues to march forward with the introduction of Halo. Halo is a head protection device that will protect the drivers from debris in the event of a massive accident. As it is a major change from the previous seasons, one will require some time to get used to the sight of Halo. The number of power units for a driver has been restricted to three, down from four from last season. The usage of a suspension package that improves the machine performance has been restricted. Ferrari and Red bull reportedly used a variable ride height suspension during the last season. In the wake of allegations against some teams regarding the issue of (deliberate?) oil seepage into the fuel tank, stricter regulations are in force. The minimum weight has gone up by 6 kg from last season. Now they should weigh at least 734 kg. The inclusion of Halo adds a further 15 kg to the car and the manufacturers are hard pressed for options. Heftier drivers will come under scrutiny. This year there are as many as seven racing compounds available, ranging from ultra soft to super hard. The collection is biased towards the softer region this season, with the hardest tyre on offer softer than its 2017 counterpart. The 2018 season will feature much faster cars, according to the Mercedes team. While they have maintained that the changes are minimal, they reckon that the performance will be significantly improved because the whole is greater than the parts. 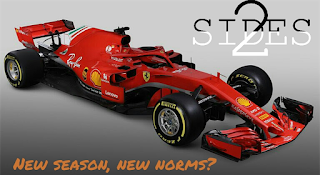 Pirelli has introduced a wider range of tyres and the tyres on which a team races alters the outcome of a race drastically. More number of options to choose from indicates more headache for the teams. A slight miscalculation could ruffle up all well laid out plans. On the other hand, the apparent shift in preference for softer compounds this season means that we could see some fast laps around the circuit. The introduction of Halo could save drivers from suffering a potentially fatal concussion. The restrictions in force this season regarding the replacement of power unit components could turn out to be a dampener. Drivers are expected to use only three engines for the 21 race season. This is down from four for 20 races for last season. This could result in an overly cautious approach. The drivers and the teams will try to play safe rather than attack relentlessly. Should they exceed the limit, they will be penalised and made to start at the back of the grid. The 2017 championship turned out to be a two-horse race, with Mercedes and Ferrari standing head and shoulders above the rest of the pack. The winter testing caused some troubles for McLaren, but the late lap by Alonso gives the outfit some hopes for the season. Hopefully, the bad times are behind them. The big three (Mercedes, Ferrari and Red Bull) are expected to dominate. We will have to wait and watch to learn whether the Mercedes juggernaut will come to an end.